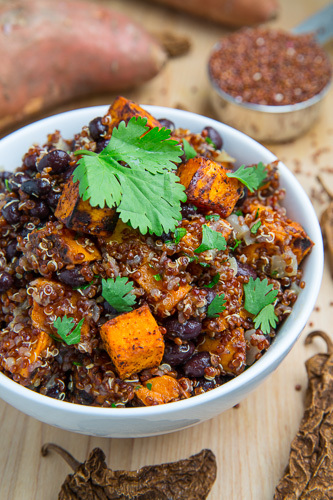 Smoky chipotle roasted sweet potatoes and black beans in a tasty and healthy quinoa salad. After all of that rich St Patrick’s Day fare I was looking for something on the lighter side which was perfect timing since this roasted sweet potato and black bean quinoa salad had been on my mind for a while. 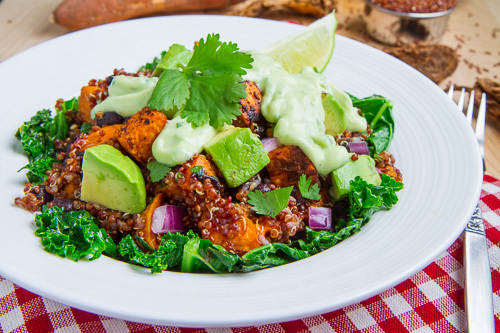 There is just something about the sweet potato, creamy black bean and smoky and spicy chipotle chili flavour combo that keeps me coming back for more and this quinoa salad is a great way to enjoy it! In addition to being super tasty, this salad is really easy to make and it only takes as much time to throw together as it takes to roast the sweet potato es! 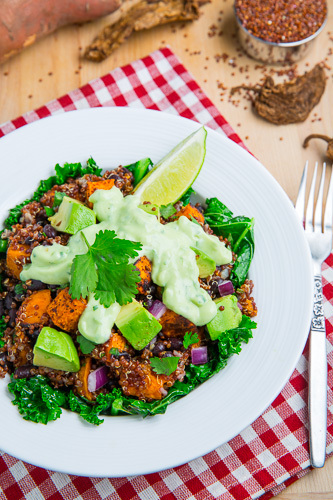 This roasted sweet potato and black bean quinoa salad is great all by itself or you could serve it garnished with cool and creamy ovocado, red onions and/or my favourite creamy avocado dressing ! I also like to serve this salad over sauteed kale to get a green vegetable in the mix. Toss the sweet potato in the oil, chili powder, cumin, salt and pepper, place on a baking sheet in a single layer and roast in a preheated 400F/200C oven until tender, about 20-30 minutes. Meanwhile, heat the oil in a sauce pan over medium heat, add the onion and cook until tender, about 5-7 minutes. Add the garlic, chipotle chili powder and cumin and cook until fragrant, about a minute. Add the quinoa and water, bring to a boil reduce the heat and simmer until the quinoa is tender and the liquid has been absorbed, about 15-20 minutes. Mix the beans and sweet potato into the quinoa and season with lime juice salt and pepper to taste. Mix in the cilantro and enjoy optionally garnished with avocado, red onion, queso fresco and cilantro along with the avocado dressing. We make a similar salad and it is a favorite at our house. Can't wait to try this recipe! Fantastic flavor profile, Kevin. I have some cilantro and some queso to use up. Sounds like lunch is planned for! Fabulous flavors and so bright and healthy. Sounds wonderful! What a beautiful salad Kevin! Love it! Such a vibrant & healthy salad ~ must try asap! I agree with Aimee, the flavor profile is INCREDIBLE- but it always is with you Kevin! WOW, not only is this gorgeous, but it sounds delicious! There's so much good stuff going on at once. I think I need this for lunch. I want to put that dressing on everything! Aww yum!! This is so full of goodness! Oh, how amazing! Looks so hearty and healthy! I love sweet potatoes and black beans together! I bet this would also be great dressed with your swiss chard pesto! Joanne: The swiss chard pesto would also be amazing on this salad! I'd love for you to come share this recipe over at Thank Goodness It's Quinoa, a bi-weekly link party celebrating all things quinoa. I know our readers will fall in love with this recipe, just as we have! made this last night- it was soooo yummy- every part of it! Unfortunately, I didn't have a ripe avocado, so I didn't make the dressing, but next time!! Made this last night- it was fantastic!! I made this last night and it was delicious!! I could just drink that dressing – it really pulled the whole dish together – and extinguished some of the heat for me… My husband said it was the best thing he's eaten in a while. Thank you!! Made this tonight and my husband and I loved it. The dressing is absolutely to die for. Next time, though, I'll use less chipotle powder as it was extremely spicy. I get my spices from Penzeys and they often are more intense than the ones available at the supermarket. Elizabeth Duncan: Corn would be a nice addition! I prefer to cook quinoa with a bit less than a 2:1 liquid to quinoa ratio and for less than 20 minutes to get the quinoa to a perfect 'al dente' texture and to make sure that it is not over cooked and mushy. Do you chill the ingredients before mixing? Laurel: This is good warm, room temperature or chilled so I like to serve it warm when I first make it and then I just eat any leftovers straight from the fridge. WOW!!!! !this is seriously one of the best things I've ever eaten. YUUUUUUUUU—UMMMMM! !